Arsene Wenger has been with Arsenal since joining in 1996. In that time he has managed to bring in an era of winning. During his tenure he has won 3 Premier League trophies, 4 FA Cup medals, and 4 Community Shields. Perhaps his biggest accomplishment is his ability to continually have Arsenal qualify for the Champions League year after year for the past 16 seasons (1995/96 was the last time they failed to qualify). However, it is looking more and more likely that they will not qualify for the Champions League this season, thus missing out on every chance at a trophy, considering Wenger’s comments about fourth place being as good as a trophy. Arsene Wenger is coming under more and more scrutiny and criticism in the recent weeks following defeats in the Capital One Cup, FA Cup and losing to Bayern Munich 3-1 at home in the Champions League. They are no longer competing for any silverware this season and they have not won a trophy since defeating Manchester United in the 2005 FA Cup. the current Arsenal Board of Directors is full of older English gentlemen that all seem to be afraid of change. Even more than this they seem to be more concerned with the money coming into the club rather than the trophies and awards coming in. They certainly don’t appear to be concerned with how they are viewed by the fans, and this disconnect could become dangerous. The money and disconnect runs much deeper than just the Board of Directors. The current majority share owner is the American businessman Stan Kroenke. Time and time again the Arsenal supporters group has called on him to address their concerns, but has remained distanced from the club. My opinion of this is that his first thought to the money being made by Arsenal and the trophies coming in only affect him inasmuch as they bring more money. He’s a man listed as being worth $4billion by Forbes in 2012. He is a businessman first and foremost. To him, Arsenal is just another means to an end, and at the moment they are a very lucrative means for him. Continuing on with the money theme is the buying and selling of players. Arsenal has made it a very profitable business to develop players and sell them on. Some of these players were sold at the peak of their careers (Henry and Viera come to mind) while others have been sold at points where they were still vital, contributing players in the squad (Fabregas, van Persie and Song especially). In order to actually get back to winning ways they need to get a solid defense to build from. They need to get some strong players that can dominate the back line. In addition they need to do the same thing in the middle of the pitch and at the front. Their defense is probably where they have been lacking the most, but there have been countless times that their lack of a clear goal scoring threat has been their downfall. Which leads into…. I won’t say that I’m an expert tactician, but it seems fairly obvious that Wenger’s tactics have let him down this season. I think the biggest problem stems from complacency and the thought that Wenger has bought into his own genius. Instead of being able to adapt and change tactics Arsene seems bent on hammering away at the same old tactics each and every match and never really deviating, even in the middle of a match where it’s clearly not working. There have been numerous matches where Arsenal have dominated in terms of possession and passing, but so often these have been pointless statistics since they have been done in areas of the pitch that don’t threaten the opponents. Any team will be content to let them pass the ball around the middle of the pitch or back in their own third. Wenger needs to stop building a team of small, quick players who can pass and start branching out. The really good teams have a combination of players and play styles that can blend together and form a cohesive team. When Arsenal built the new Emirates Stadium it was sold to the fans and supporters’ groups as a way for Arsenal to generate more money that would be put back into the club. The implication being that the money would be used to buy better players and be able to compete for the Premier League and Champions League titles. Instead they seem to have been sold a complete crock in order to generate more money for some already very rich people. My opinion of this is that Arsene Wenger is one of those included in this. He is certainly getting paid well and what he has been doing with the club has been enough to keep him going as manager. I don’t buy all of the talk of blaming the Board or the owners. They are certainly culpable, but he is every bit as much as they are. Just remember that he is a trained economist, so he is no dummy when it comes to making money. I would say that the part where he has failed is in his inability to change. He’s determined to force his players to play a particular way no matter what, and that becomes quite a deadly concept in the world of football where managers are hired and fired like trading baseball cards. Should Wenger get sacked? I’m not sure I can answer this one. The issues at the Arsenal Football Club run much deeper than the manager and having him fired will not change much of anything. What are your thoughts on the matter? 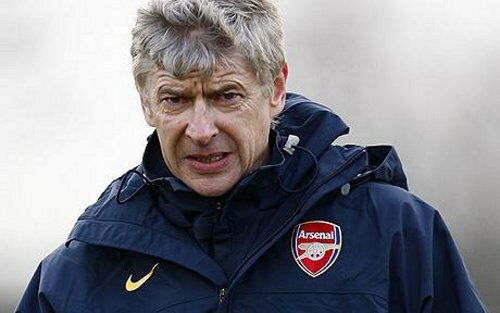 Is it time for Arsenal to sack Wenger? Perhaps it would be better for him to walk away from the team? Maybe the Board of Directors are to blame and need to be replaced? Please let your opinions be known below.